If you are looking for an affordable and efficient Prosper fiberglass pool repair, pool resurfacing or pool servicing company in TX, Texas Fiberglass Pools Inc. is here! At Texas Fiberglass Pools Inc. not only fixes problems with your pool but also can handle your regular maintenance needs and other major work like resurfacing. We are available to help you make the most of your pool ownership for years and years to come. If you have a fiberglass pool, you will notice that the surface will weaken over time. At Texas Fiberglass Pools Inc.. we have a few resurfacing options available to help bring your pool’s surface back to life. A pool crack may look like a minor annoyance, but in actuality, a crack can cost you a lot of money in the long run. As the water leaks out of your pool, the more it’ll cost to fill it up. Not to mention the damage a crack can cause over time. At Texas Fiberglass Pools Inc. our Prosper fiberglass pool repair experts will repair your pool crack the right way the first time, so you will not have to pay for repeat pool crack repairs. Pool leaks can come in the smallest size. So, if it has been a while since your last pool service, there is a chance you might have a pool leak and not even realize it. Unfortunately, the only evidence would be an elevated utility bill, and even then, it can be rather hard to notice because higher bills are usually received in the summer anyways. To help combat this, every so often, it is a good idea to make sure your pool is in tip-top shape. 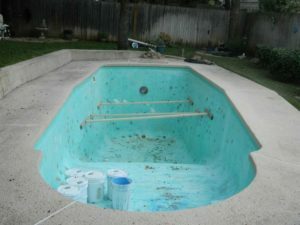 Texas Fiberglass Pools Inc.. will inspect your pool to make sure your pool has no small, insidious pool leaks. Just like the other machines in use at your home (your HVAC system, your kitchen appliances), old pool equipment can become inefficient over time. Your utility bills can creep up, and you might find yourself using more pool chemicals to keep the water clear. If your pool has not been upgraded or renovated in some time, we can upgrade and repair your pool to ensure you have the best possible experience as a pool owner in Prosper. You might not realize it, but fiberglass is an ideal surface for a baptistery, and Texas Fiberglass Pools Inc. offers a full range of services related to the repair and resurfacing of baptisteries in Prosper. Fiberglass helps your baptistery pool remain sanitary and safe, as well as beautiful and clean. We can ensure your baptistery lasts for many decades with our repair services. We’re committed to working as the premier provider of repair and resurfacing of baptisteries in the Prosper area and the surrounding region. You may enhance the appearance of your swimming pool with the addition of beautiful flagstones or stonework from Texas Fiberglass Pools, Inc. Not only can we ensure your pool remains in excellent condition, but we can also provide beautiful textures to enhance the appearance of your pool and its surroundings. A patio is an excellent option for increasing the footprint of your home without investing in an actual addition on the house. Do you own a well-loved yet well-used pool that needs repair or maintenance? Is it time to resurface your baptistery? Are you interested in adding beautiful stone work to the area that surrounds your pool? From Prosper fiberglass pool repair and maintenance to resurfacing and everything in between, we offer comprehensive assistance for maintaining your swimming pool. Contact Texas Fiberglass Pools Inc. today to book your appointment. Fill out our short form to get immediate help with your Swimming Pool issue.